By selecting the “Accept License Agreement” button, you are agreeing to be bound by the terms of this Agreement. This Agreement, in conjunction with the receipt that accompanies each purchase from CastleType.com (“CastleType”), constitutes the complete agreement between you and CastleType. CastleType may, from time to time, update the licensed fonts. Upgrade pricing may apply. 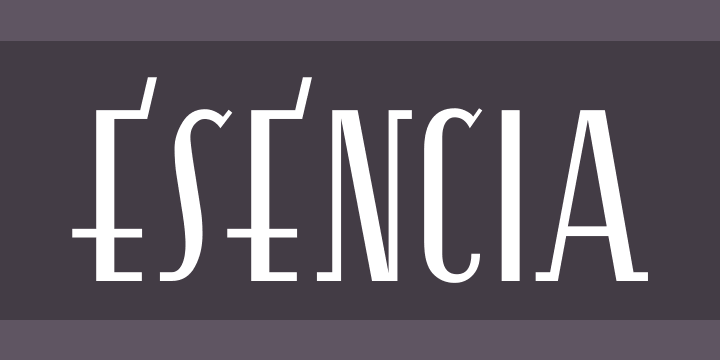 Esencia™, a CastleType original, was inspired by a Spanish stock certificate from 1941 with 11 beautiful art deco style letters for the words “PERFUMES y ESENCIAS”. Slender, elegant, with a Spanish flare. Supports most European languages that use the Latin, Greek, or Cyrilllic alphabets. Includes alternates for B, D, E, F, K, P, R, and S.